There has been stiff competition in the sub-Rs. 10,000 segment, and majority of smartphones launched lately in this price band have great specifications. This year in particular has been a good one for Indian consumers looking for budget phones, as companies are racing to offer more for less. Xiaomi, which has had a great run in the Indian smartphone market with the well-received Redmi Note 3 and Mi Max , is keeping up the pace with a new smartphone priced below Rs. 10,000. The Xiaomi Redmi 3S and Xiaomi Redmi 3S Prime are the company’s latest attempts to strengthen its position in the segment, and they both also tout the ‘Made in India’ label. Since its debut in India two years ago, Xiaomi has managed to earn a reputation for offering great smartphone hardware at affordable prices, and these new models are trying to stay true to that formula. Not long ago, Xiaomi sized-up the Redmi Note 3 to make the gigantic Mi Max. Now, it just shrunk the Redmi Note 3 down to make the Redmi 3S Prime. The Redmi 3S Prime is simply the Redmi Note 3, only scaled down to fit the Redmi 2 Prime’s cute and comfy form factor. 5-inch phones are hard to come by these days. The Redmi 3S Prime belongs to that rare category of smartphones. And to me, that’s a huge thing. You see, I just love 4.7-5-inch phones. They just have the right size. The Redmi 3S Prime, as expected, feels right in the hands. It’s not as small as last year’s Redmi 2 Prime (which was 4.7-inch) and yet not as phablet-sized as the Redmi Note 3 (which is 5.5-inch). Size is not the only “big” highlight of Xiaomi’s new ultra-budget smartphone. The Redmi 3S Prime boasts of a full-metal body: a first for any smartphone in and around this product category. The top and bottom ends are of course plastic with brushed metal finish and have a slightly different hue as compared to the rest of the body, but given its low price, I think you should give it the benefit of doubt. An all-metal smartphone at just under Rs 9,000 was a sight for soar eyes, until now. In this case, the front of the Redmi 3S Prime is almost identical to that of the Xiaomi Redmi Note 3, except for the placement of the sensors above the display. We get capacitive Home, Back, and Recents buttons right below the display, and the sensors and front camera sitting on either side of the earpiece just above it. The rear panel packs the primary camera with its LED flash, both placed in the upper right corner. The back also has the fingerprint scanner placed in the middle. There are thin lines running across the top and bottom of the back of the Redmi 3S Prime, which we have also seen before on the Redmi Note 3 and Mi Max. The speaker grille is at the bottom of the back. The physical buttons for volume and power are on the right, while the hybrid SIM slot is on the left. The phone accepts one Micro-SIM and another Nano-SIM or microSD card for storage. Unfortunately, this means that users will have to choose between a second SIM and a microSD card. There is an infrared emitter and a 3.5mm audio jack on the top. The bottom has a standard Micro-USB port and a microphone. The Redmi 3S Prime sports an all-metal body which means that the device itself feels premium regardless of the price tag it carries. At 144 grams, the Redmi 3S is slightly heavy for a budget device, but the curved sides make it easy to grip. The extra weight can safely be put down to the massive battery inside the smartphone. The Redmi 3S Prime runs Android 6.0.1 Marshmallow-based MIUI 7 out-of-the-box, much like the Mi Max. As expected, you get a user interface with lots of fancy colours schemes and animations, and no app drawer. Latest software iteration does not necessarily translate to drastic changes in Xiaomi’s interface. There’s generally very little difference between a KitKat-based MIUI and a Marshmallow-based MIUI which could be a deal-breaker for stock Android fanatics, even more so because Xiaomi’s MIUI kills off key Android 6 interface elements, like Now on Tap. 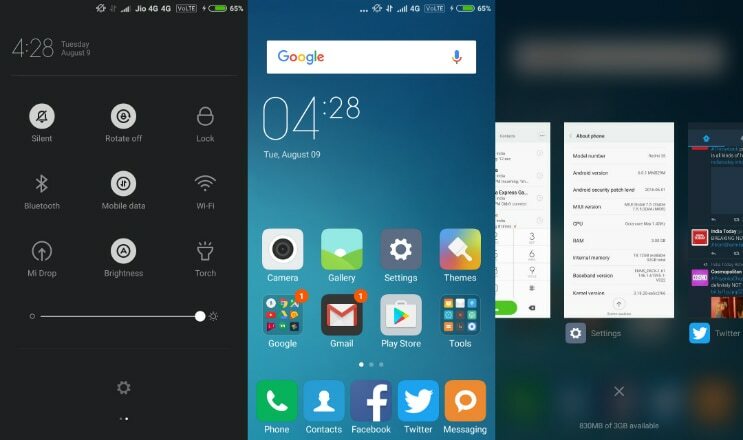 If, however you are not a “stock Android fanatic”, MIUI 7 offers all the bells and whistles that you’d want from a fully-functional operating system, including themes. Moreover, the upcoming MIUI 8 is expected to bring back features like Now on Tap. 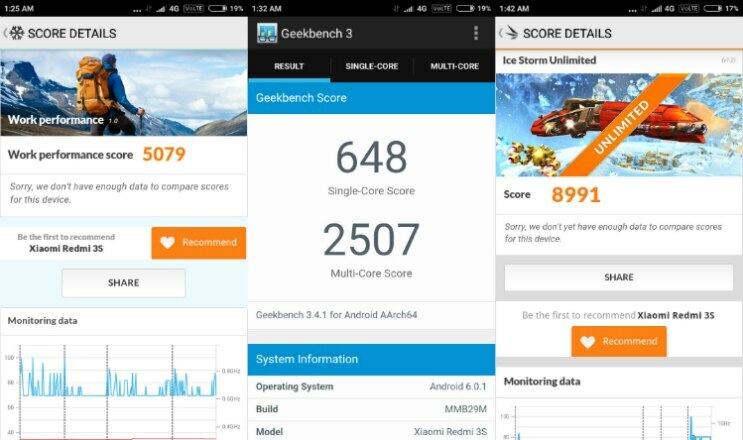 Even if it doesn’t, the MIUI 8 is definitely going to be a thorough upgrade to its predecessor. I’ve been using the MIUI 8 beta for a while now, and some of its features like scrollable screenshots, second space and dual apps are worth the wait. The Redmi 3S Prime is powered by a 1.4GHz octa-core Qualcomm Snapdragon 430 processer coupled with Adreno 505 GPU and 3GB of RAM. It comes with 32GB of internal memory which is further expandable by up to 128GB via a microSD hybrid card slot. The dualSIM phone supports 4G LTE (VoLTE-ready) and USB OTG. There’s no NFC though. The Redmi 3S Prime sports a 13-megapixel camera on the rear with f/2.0 aperture, Phase-Detect Autofocus along with an LED flash. On the front you get a 5-megapixel snapper. Honestly, none of the new-age Xiaomi phones — Mi 5, Redmi Note 3 — have really impressed as far as camera performance is concerned. They’ve been just about average. The Redmi 3S is more or less on similar lines, only overall, I feel it does a better job as compared to the Redmi Note 3. The Mi 5 still is the best Xiaomi camera phone right now. The phone captures some good-looking photos in good light with good amount of detail and mostly spot-on (if a little oversaturated) colours. Dynamic range could have been better but then none of the camera phones at under Rs 10,000 have dynamic range to really brag about. They are just about average. The Redmi 3S is a tad better. The front-facing selfie camera is just about average with some noise, even in good lighting. The Redmi 3S Prime, in the grand scheme of things, is the best camera phone that you can buy right now in this price bracket without burning a hole in your pocket. Xiaomi makes some good phones. More importantly, it makes good phones that are also aggressively priced. The combination is quite a steal, I tell you. But not always. Rival companies are catching up really fast. The Mi 5 is perhaps the company’s biggest lost opportunity in India. The Mi 5 although an excellent all-rounder, hasn’t been a hit like its previous flagship phone, the Mi 4. This is because the OnePlus 3 trumped it big time. The Redmi Note 3 was a glimmer of hope then, but even that phone is facing some stiff competition from the likes of the LeEco Le 2. There’s an even cheaper option in the standard Redmi 3S. You’ll get lesser RAM (2GB), lesser storage (16GB) and no fingerprint scanner. But then, it also costs just Rs 6,999. Not bad, not bad at all.